A knight in shining armor awaits you! A knight on horseback with lance and shield, ready for the medieval tournament, is printed on the black top section in glistening silver ink. 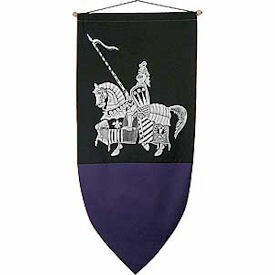 The banner is finished with bottom section of purple, long a symbol of royal power. 48" high x 22 1/2" wide. Includes kit for hanging.